With this product, you earn 199 loyalty point(s). 199 points = $1.99. Welcome to our YouTube Videos! HPA is a highly reliable High Power Amplifier series which combines twelve high power amplifiers with single power supply solution. The entire HPA series is driven by Class-T (a branch from Tripath Class-D) modulator and the entire series supplies very warm and powerful sound. With more than 10 years' experience in audio design, our skilled engineers ensure that our products always have better layout than our competitors. With supreme features like signal loop and components optimization during design and measurement, we can provide better sound quality products, with higher SNR and lower THD+N. 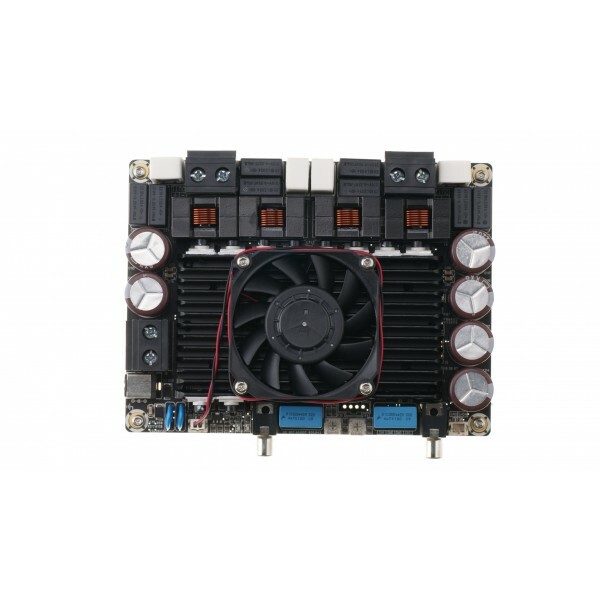 The HPA series allows a universal power supply voltage range from DC48V to DC200V (For HPA1, the power voltage range is DC48V - DC200V while for HPA2, the power voltage range is DC48V - DC120V). Taking full account of the power solution, the HPA series is designed based on Class-T (a branch from Tripath Class-D) modulator. 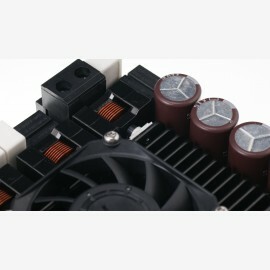 Each model can be powered by DC power supply directly. 48V switching power supply units are common used in industrial applications and it will be enough to evaluate our amplifiers. For amplifiers, higher input voltage means higher power. 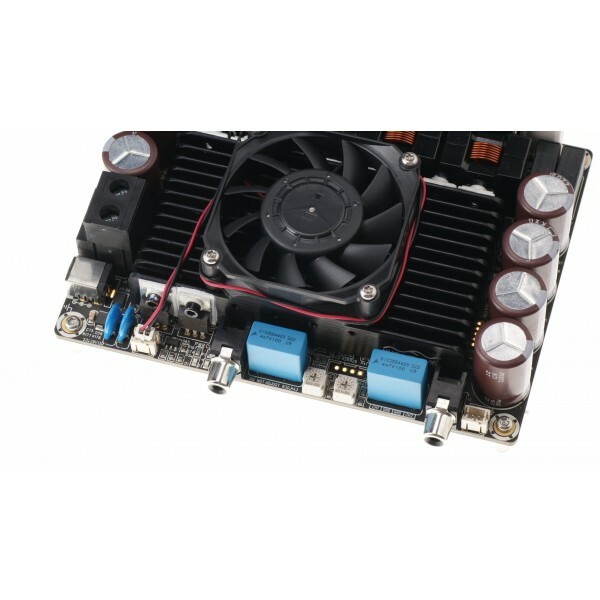 For those customers who require higher power, assorted boost converters and AC-DC power supply modules are also available in Sure Electronics then you can get the 2kW audio and power solution without any difficulty. Application customers can free up the development resources and greatly reduce the installation time and system cost. Contact Sure Electronics at (info@sure-electronics.com; info@wondom.com) for a wider power supply range customization.With its low output impedance, the HPA series supports loads from 1.5Ω to 16Ω without impact by loudspeakers loading characteristics. We have already optimized for the frequency response of load and the HPA series has been tested with both capacitive loads and resistive loads like coil, electric furnace and resistor to ensure the amplifier’s stability and performance.However, extra attention should be paid for any operation with purely capacitive loads. For any non-audio applications, customers are suggested to send an inquiry e-mail to Sure Electronics for system compatibility confirmation or face the consequences. With the high efficiency up to 93% and the extremely low standby power consumption below 2W, HPA series fulfills the high power with high efficiency. 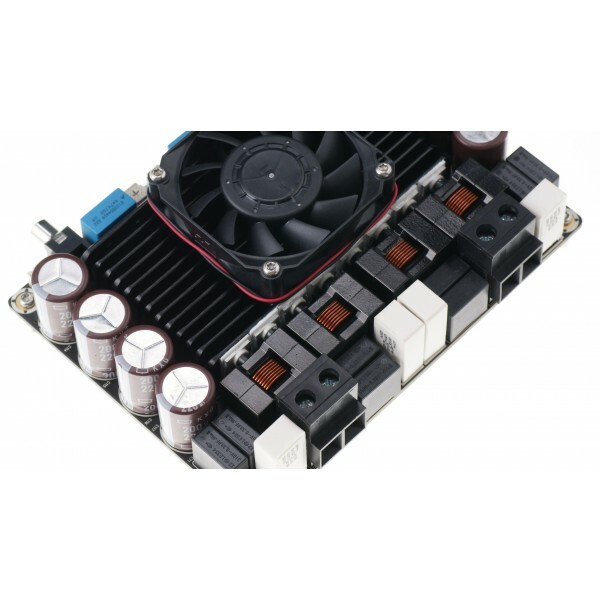 Superior design and layout; dedicated heat dispatch design with thermostatically controlled fan; high quality selected components; all these features enables HPA series excellent power and can operate stably and continuously at the rated power from 500W to 2000W. The entire HPA series provides a 6 x 4.5 inches dimension which is compact and convenient for integration in any applications. With the total height 1.6inch (40.6mm), this series can be integrated into the 1 U enclosure without any difficulty. Sure Electronics can also provide the relevant power solutions with the same ultra-compact design. Application customers can free up the development resources and feel the flexibility and convenience only by a combination of these boards. The HPA series is designed with the fundamental concept of reliability and ruggedness. HPA series is tested by 1kW resistor dummy load and 2550W air conditioner in parallel. These tests are made to ensure each amplifier can survive in the roughest industrial environment or subwoofer applications. For customers with requirements of high power and high reliability, HPA series is the fully-deserving choice with high cost-effective. Contact Sure Electronics at (info@sure-electronics.com; info@wondom.com) to feel the true RMS and real strength. The entire HPA series provides a very sensitive auto signal detection functionality which detects the main input audio signal and switches to corresponding channel automatically. Along with standby functionality, HPA series provide a more convenient solution to control your system, save your engineering cost and improve operating experience. The standby current consumption is only several mA, or typically less than 2W, that is amazing for kW amplifiers and will keep a very high headroom for your Energy Star or CE certification. To provide a very high sound quality, we use a high carrier frequency in mute or play state, but we still provide a low power consumption and high efficiency, take reference from the datasheet. Besides of built-in chip protection, ESD and spike protection components used throughout input and output of the amplifier board ensure its robustness and reliablity. Also, HPA series is equipped with the High Voltage Anti-Reversing protection as low as the ideal diode. This can able to avoid permanent stressed caused by unproper operation. We always use IRF(now Infineon), Infineon, and other world grade MOSFET suppliers, we use only Nippon Chemi Corporation electron capacitors, original SAGAMI inductors in this series and all other components from original manufactuer or authorized distributors only. We can always provide commecial invoices from our suppliers - only original or authorized. 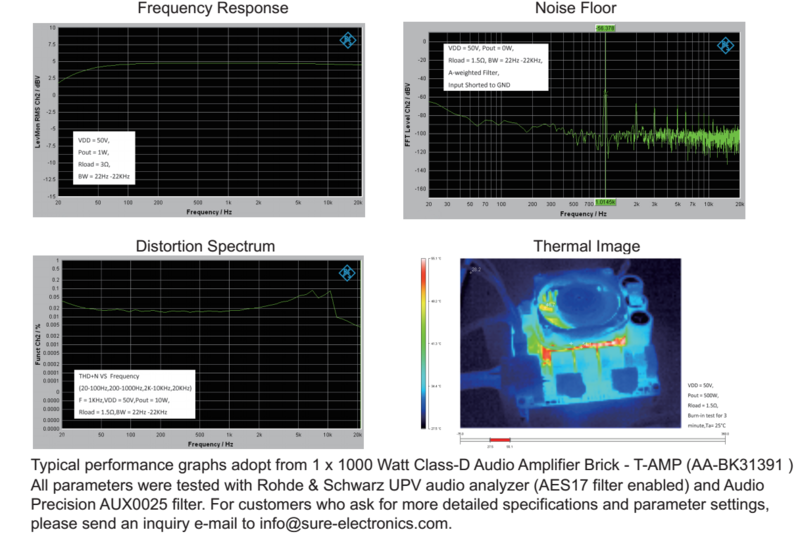 Sure Electronics fine selects low power consumption solutions, while we never hesitate in high sound quality op-amps even if they will consume a bit more power. 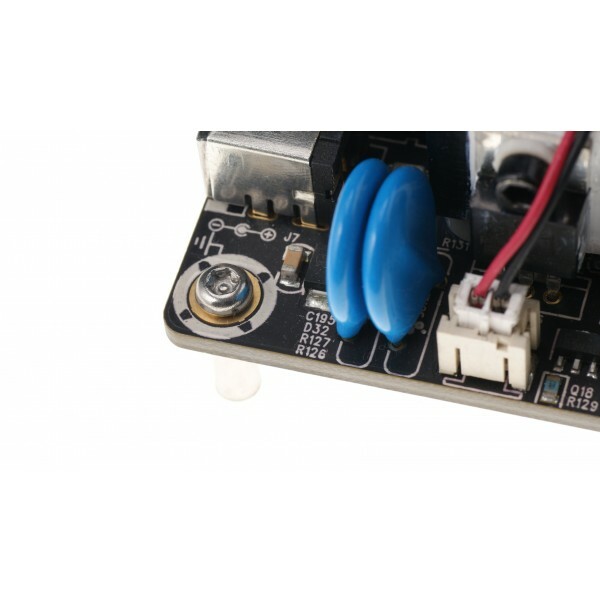 For those standalone Bluetooth audio reciever boards, typical power consumption is about 10mA, and to provide high sound quality, we suggest customer to use 5-6V power supply. In our Digital output (w Analog output or not) Bluetooth reciever board, we use both DC/DC and LDO, to make a 2 stage power supply circuit that provide both high efficiency and great sound quality at the same time. Sure Electctronics provides a flexible DSP plateform with potentiometers and programmer IOs for digital crossover and audio tuning. The on board fully programable 28-/56-bit audio DSP ADAU1701 from Analog device is competent in various of signal processing applications. This processing can be used to compensate for real-world limitations of speakers, amplifiers, and listening environments, providing dramatic improvements in perceived audio quality. Most processing is done in full 56-bit, double precision mode, resulting in very good low level signal performance.Two Σ-Δ ADCs and four Σ-Δ DACs integrated in this DSP provide a 98.5 dB analog input to analog output dynamic. Each ADC has a THD + N of -83 dB,and each DAC has a THD + N of -90 dB. 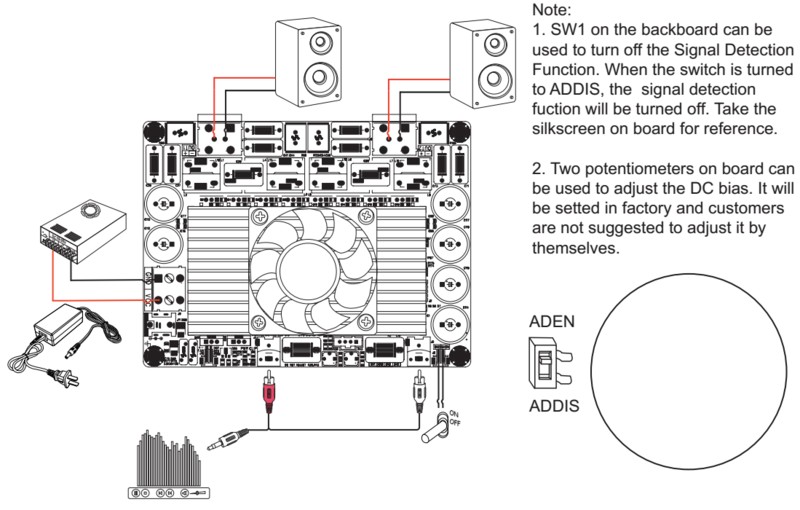 The popular applications in active louderspeaker,public address system and active subwoofer, including stereo high pass filter and mixed low pass filter, also named with powered speaker controller, demonstrated on this board as follows. Sure Electronics ensures that no product will be stopped manufacturing within 5 years. Bluetooth products are something that always get a short product life, but Sure Electronics always signs long term contract with its suppliers and guarantees a 5 years product life. Even if we really get some problem in this, we will provide full pin to pin, screw to screw compatible solutions for our customers. To meet our customers requirement in Just - In - Time manufacturing, Zero Stock policy, Sure Electroincs always provides enough stock. For most audio products, Sure Electronics always keeps more than 1,000pcs stock, and for best sellers, we keep more than 3,000pcs. That means Sure Electronics keeps about 100k pcs circuit boards in stock at any time. That is true. In our Nanjing Stock, we have more than 80 CBM of finished products, and more than 100 CBM for half finished products, which are turning in very fast cycles. We can ship more than 98% requriements of our standard products - that is amazing, right? Kindly Note:The Red marked products will be soon released.